At the forefront of a trend: Mid-Century makeover on a historic and prestigious street in Spanish Fort Estates. The result is a stylish, one-of-a-kind home where certain times of the year you can get a glimpse of Mobile Bay. Melding the original charm with updates, you'll find hardwood floors throughout the main level; open and light entry and living room, with wood-burning fireplace with tile surround and granite hearth. Transition into the open dining area into the kitchen where the updates include: Quartz countertops, under-counter lighting, tile backsplash, and all new appliances including a KitchenAid downdraft range and Whirlpool fridge and dishwasher. Hall bath has new fixtures; half bath is cute retro (could be made into full bath). 484 square feet in basement (included in MLS square footage) includes 23x13 rec room, large laundry/storage and under subfloor storage. Updates didn't end at the surface. Here's what's new: energy-efficient windows & doors; new HVAC upstairs and down with gas heat; all new lighting, ceiling fans & wiring; concrete driveway, sidewalk and rear patio; fencing; and septic alert system. Lawn has been professionally designed and landscaped. Large fenced backyard touches Fort McDermott at the southeast corner. Furniture is negotiable. 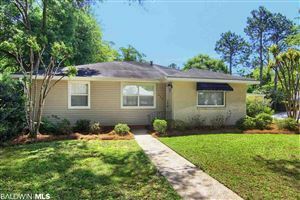 This home is extremely convenient to Mobile & Pensacola with I-10 just minutes away. It's also close to shopping, parks and schools. This addition of Spanish Fort Estates has restrictive covenants, but no mandatory dues.